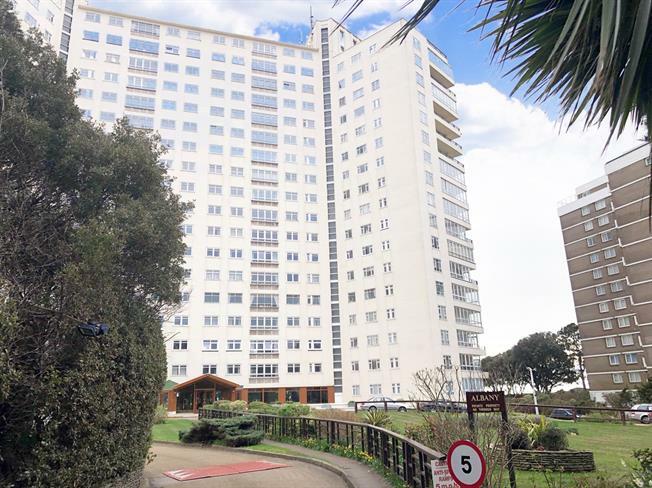 4 Bedroom Flat For Sale in Bournemouth for Asking Price £550,000. DIRECT SEA VIEWS Austin and Wyatt are delighted to be able to offer for sale, this spacious seventh floor executive apartment. Located in the heart of the East Cliff, in the iconic Albany development, this property enjoys spectacular direct sea and coastal views. The accommodation briefly comprises of an entrance hall, 36ft dual aspect lounge/dining room with direct sea views, a 27ft open South facing balcony with panoramic views, a lovely modern fitted kitchen, a South facing master bedroom with direct sea views, access to the balcony, en suite bathroom with dressing area and fitted wardrobes, three further bedrooms, a family bathroom and further shower room. Further benefits include a share of freehold, private lock up garage and a twenty-four hour porter service. Fantastic en suite with UPVC double glazed window with sea views. White suite comprising of a close coupled WC, bidet, panelled bath with mixer tap & hand shower attachment, pedestal wash hand basin, shaver point, glass shower enclosure, towel rail/radiator, fully tiled, ceiling spotlights. PRIVATE LOCK UP GARAGE - Providing secure private parking for one car.